In March 1995 nearly a dozen people were killed and thousands injured when a deadly nerve agent sarin was released into the Tokyo subway system by a Japanese cult. This is a cause for concern - what if a similar attack happens in a U.S. transportation system. It would require the system to shut down for weeks resulting in a huge economic impact. Craig Tenney, a chemical engineer at Sandia National Laboratories, is keen to find better ways to clean contaminated concrete to decrease that impact. We can’t just rip out and replace the affected concrete — that would be too expensive. We need to decontaminate it and make it safe. The public has to be confident enough to come back and use the affected facility. The project, funded by Sandia’s Laboratory Directed Research & Development program, uses computer simulations to study the way chemical agents soak into and bind within concrete. The power of the simulations is that they allow researchers to view details they cannot get via experiments. A chemical was used on a concrete block by the researchers in order to clean it and then detect any residual chemicals, however, as Tenny explained, this does not allow them to view the inner operations. Decontaminating concrete is tough because it is physically and chemically complex. Tenney and his team need details regarding the chemical interactions that happen in concrete so they can develop new decontamination techniques and mixtures. Concrete has been used since the Roman era, and is everywhere: building sidewalks, foundations, and even unique underground linings and seals. But its ubiquity covers significant physical intricacy and chemical complexity, said Ed Matteo, a chemical engineer who is an expert in cement durability. Concrete components can change, depending on how spongy or porous it has to be, however the essential ingredients remain the same - similar to baking a cake. The “flour” is the roasted and finely ground limestone and the clay, which is blended with water to make the sticky “dough” known as cement. Concrete is simply cement with sand or gravel added to bulk up the blend. Other elements can be added to alter properties, such as the time taken to set. Cement is also composed of a number of minerals such as calcium oxide of quicklime, aluminosilicates from clay, and even potassium hydroxide from potash. But the most significant component is amorphous calcium silicate hydrate, the “glue of the glue,” said Matteo. Cement needs water and is highly alkaline. All of this influences the way chemicals respond to concrete. Besides its chemical complexity, concrete is highly spongy, and very hard to clean up. From the outside it may not look so, but concrete has numerous microscopic pores that allow a concrete structure to capture chemicals and at times “breathe” them back out. This indicates that even if the concrete surface is cleaned, there could be hazardous chemicals from an event still remaining deep within. 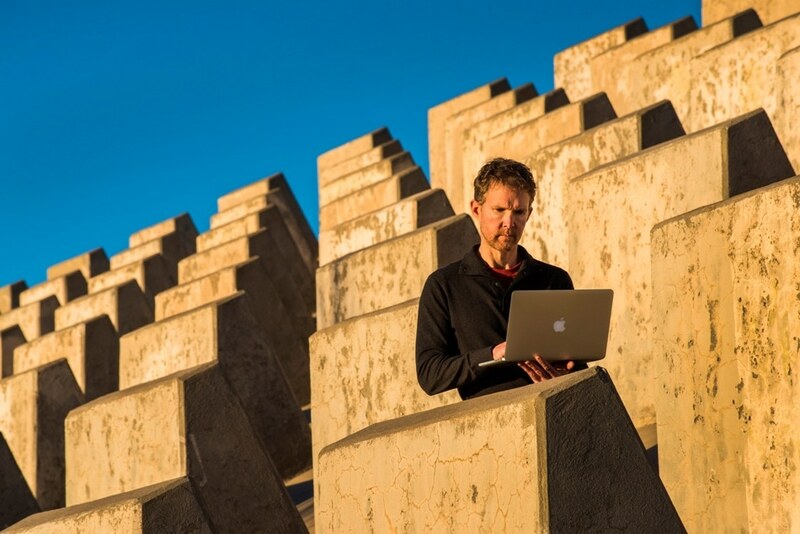 Based on Sandia’s expertise in molecular-scale geochemical simulations, Tenney and team modeled many long-term, oily chemical agents to observe the way in which they respond and move within miniature water-loving concrete pores: how they deform and where they spend their time. These simulations monitored many molecules of chemical agents twisting for several nanoseconds in nanometer-sized pores 5,000 to 10,000 times narrower than a human hair. The team confirmed the simulations against the available experimental data, which offered a suitable starting point. Based on that knowledge and his know-how in atomic-scale models of chemical reactions, Chris O’Brien, a computational materials science postdoctoral researcher, studied the way chemical agents deform in concrete. He created an agent bound to many representative concrete environments and monitored the way this contact accelerated or restricted the usual break-down process. He plans to study other chemical agents, if time and funds permit. The team will use the findings to establish the ideal way to cleanse concrete exposed to harmful chemicals. There is a lot more to be achieved by Tenney and his team before they can recommend newer decontamination mixtures for concrete, but they have established how powerfully a number of agents stick to concrete pores and which ones cluster together. Tenney is keen to partner with geochemists to see the bigger picture. Using data obtained from the nanoscale models as a preliminary point, they could then study larger bits of concrete - still smaller than a human hair - and monitor the way chemical agents soak into the concrete. Tenney feels that once the team is able to understand the movement of chemical agents in concrete, then they could recommend decontamination mixtures that would travel in the same manner, following an agent to its concealed place within the concrete. One advantage of the computer models is that they allow moderately fast assessment of various potential decontamination solutions, often much faster than experiments. This will allow Tenney’s team monitor several different formulations to assess which ones are ideal at drawing the agents out of concrete or away from each other. Another future objective is to experimentally investigate these new decontamination techniques on concrete contaminated with sample chemicals to confirm the insights obtained via the computer modeling. Their findings from the computational models could pave the way for more accurate field tests, said Tenney. Tests that precisely establish the areas influenced by an event and whether the cleaning was successful would enhance the reliability and efficiency of decontamination. Yes, it would be great from a scientific perspective to just understand what’s going on, but from an engineering point of view, it would also be darn nice if we could take that understanding, tailor our approach for decontamination and make it better. This is a national lab-scale problem and there are lots of little pieces that need to be put together to solve a big problem. If the unfortunate ever does happen, at least we [will be] prepared.